The legendary Danish children’s TV show ‘Sonja fra Saxogade’ lives on! Thanks to a plant-loving enterprise initiated by local residents in the Copenhagen district of Vesterbro, there are plans to name a new ‘square’ after the children’s character. 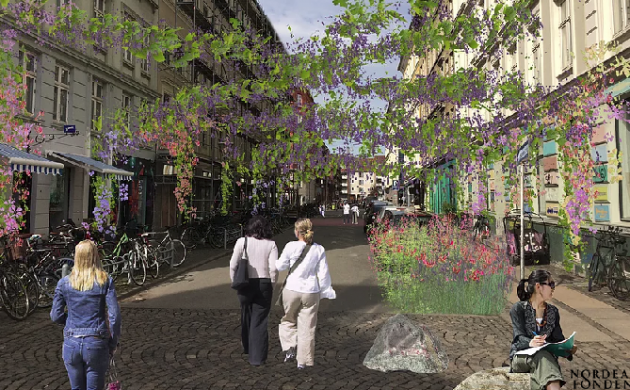 The plans for the street of Saxogade are – in a flower power sense – quite revolutionary. As well as erecting facades of wall-to-wall foliage along the street, a network of criss-crossing cables will enable the residents to suspend bloomage in the air. The elimination of a parking space and addition of a stone space in the middle of the street, ‘Sonja’s Square’, as well as a number of benches will help envisage the kind of scene Roald Dahl would have dreamt up had Willy Wonka preferred crocuses to chocolate. A recent poll found that 18 of the 19 local residents and businesses supported the project, with just one noting they were indifferent. Part of the funding is already in place thanks to the support of Nordea-fonden and there are plans to crowdfund to raise the rest of the necessary capital. Enghaveparken, a green area at the end of Istedgade used by thousands of local residents for recreational activities and by festivals such as Distortion, is scheduled to close its gates on June 11 and not reopen until the autumn of 2019. And no, it has nothing to do with the new Metro. Work will shortly begin on making the park more conducive to retaining water – namely the installation of a dyke encircling the park and a large underground rainwater basin – thus improving Vesterbro’s floodwater defences. The park will reopen with better lighting, more trees, a safer infrastructure, a new ball park, and a new ice rink. The playground, however, will remain open during the construction work. A recently-assembled control team at Copenhagen Municipality uncovered 37 percent more social dumping cases in the first three months of 2018 compared to the same period in 2015, reports Fagbladet 3F. City mayor Frank Jensen hailed the findings – the result of many unannounced visits to workplaces – saying that it validated the municipality’s decision to take the efforts in-house. The use of cheap, normally migrant labour is particularly common in construction, catering and cleaning, and Jensen said it was about time the municipality uncovered the culprits, not the media. It had previously outsourced the social dumping detection work in 2014. The last place you want to burn down when there might be casualties in a fire is the hospital. And last night, that nightmare became a reality at Holbæk Hospital in north Zealand, although fortunately nobody needed medical attention. Some 80 firefighters and 20 fire engines tackled a blaze that threatened to spread all over the 4,000 sqm complex. It is believed the fire, which was safely under control by 03:00, started in the hospital laundry. The number of one-day fishing permits issued in Danish urban areas rose by 135 percent between 2007 and 2017, according to Fiskeristyrelsen, the national fisheries agency. “We’re mostly talking about novices or people with limited experience who want to try it out,” professional angler Gordon P Henriksen told DR. “It’s something of a shift in society. Clearly more people want to get away from their screens.” A one-day permit costs 40 kroner, while an annual permit costs 185 kroner. Dantaxi 4X48, the country’s oldest taxi company, is up for sale. PwC Corporate Finance is handling the sale, which includes the company’s name, call centre operations in Virum and customer database, as well as the rights to operate the Moove app, which has around 100,000 users. However, the 1,400 vehicles used by the company belong to the drivers, not Dantaxi 4X48. At the last AGM, some 95 percent of the drivers approved the plans to sell. The company’s chief executive, Carsten Aastrup, told Frederiksborg Amts Avis the time to sale was “optimal” in light of the recent liberalisation of the Taxi Law. Dantaxi 4X48, which can trace its roots back to the foundation of Holte Taxa in 1926, officially started in 1937.